In a world where there are too many wonderful books to be read and too little time in which to do so, I always welcome recommendations of books that I might enjoy. One such book was The Warden by Anthony Trollope which was recommended to me by a friend who told me to read The Warden and then afterwards to read Barchester Towers regardless of whether or not I enjoyed it because that one was so much better. Dutifully, I went out and got myself a copy — in fact, I’ve somehow ended up with three — and sure enough, I am a Trollope convert (not to be confused with a converted trollop, I hasten to add). It also fits in rather nicely with the Victorian Literature Challenge and, although it is my fourth book towards the challenge, it is the first ‘traditional’ Victorian novel that I’ve read so far this year. The eponymous Warden is Mr Septimus Harding, who presides over the twelve bedesmen of Hiram’s Hospital, a local almshouse. Everyone lives a comfortable, happy life until John Bold, a zealous young reformer who comes courting Mr Harding’s younger daughter, launches a campaign to redistribute the way that the income from the Hospital is apportioned between the bedesmen and the Warden as Bold believes the Warden receives an unfairly large amount. Soon the press are involved, Mr Harding’s good reputation is tarnished, the bedesmen become increasingly eager for more money and Mr Harding’s son in law Archdeacon Grantley is interfering. But the biggest problem of all turns out to be Mr Harding himself. Ever since reading Elizabeth Goudge’s cathedral city books at the prompting of a wonderful English teacher I have been a fan of gentle stories of the clergy in which very little happens, so I was sold on the concept of The Warden before I even began to read it, and I wasn’t disappointed in the slightest. The story is sweet, charming and amusing, absorbing because of its characters and the way in which it is told rather than for what happens. By far the most appealing aspect of the book is Trollope himself. His narratorial style is both distinctive and enjoyable. I love the way in which he alternates between protesting that he has no control over what happens to the characters as they act entirely of their own volition and assuring the reader not to worry about the characters because he knows exactly what will happen to them and it is nothing bad. His persona as the narrator come as being genial, jocular and slightly bumbling, like an elderly uncle in a Dickens novel (an impression not helped by his bearded and bespectacled physical appearance), but at the same time it is impossible to forget that as an author he is sharp and intelligent, capable of making keen observations and challenging accepted ideas even though the story itself is very mild. I enjoyed this so much that I think I’d gladly read him talking about almost anything if this is the style in which he does it. 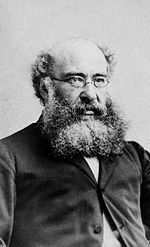 Thankfully I have lots more Trollope to discover as this impressively prolific author wrote forty-seven novels, as well as a handful of other works. The Warden by Anthony Trollope, illustrated by Peter Reddick. Published by the Folio Society, 1976, pp. 234. Originally published in 1855. Welcome to the wonderful world of Trollope! I’m just about to start A Small House at Allington (fifth in the Barsetshire series) myself. I’m glad you enjoyed this. Trollope was a new discovery for me last year and I immediately fell in love with his writing style. I’m also working my way through the Barsetshire series at the moment – so far I’ve read The Warden and Barchester Towers and am hoping to read Doctor Thorne soon. This is on my list for this year, so it’s lovely to read a positive report. I just have to finish longer term reads of Dumas and Dickens first! It is indeed a wonderful world. I’m glad to hear you’re enjoying these books too, and it certainly bodes well for me! He has a very distinctive voice, doesn’t he? I can’t remember the last time I read a book where I was so aware of the author and how I was being directed. It makes for an interesting reading experience. It’s definitely worth getting round to, as (if ‘The Warden’ is anything to go by), his stories are just so pleasant. In Dickens the bad characters will always get their comeuppance, but in this book there weren’t any bad characters at all, just a bit of legal beaurocracy to contend with. I’ll be turning to ‘Barchester Towers’ the next time I want a lovely, relaxing read.